The wildflower bouquet on my kitchen table is different than it was even a couple of weeks ago. As the earth tilts toward fall in our part of the world, many of the flowers I’ve gathered all summer from roadsides and ditches just aren’t pretty any more. Some are dull and wilted. Some have been chewed ugly by insects. Others are gone altogether. My vase is filled now with goldenrod and ironweed and the last of the Queen Anne’s lace, not black-eyed Susans and butterfly weed and purple clover. But there’s one lovely flower, a constant from late spring until first frost, that I know better than to add to the mix. Also known as blue daisy, blue dandelion, blue weed, coffee weed, horse weed and wild bachelor’s button, chicory is a woody perennial that sports bright blue flowers. Flowers so delicate and lovely that they would enhance any bouquet. Except for one thing. They close up the minute you cut them and take them inside. What possible good is a wildflower like that? Immensely good, as it turns out. Because chicory is both food and drink. Its leaves, though somewhat bitter-tasting, can be eaten raw as salad greens or sautéed with onion and garlic to become a hearty vegetable. But chicory isn’t just good for humans. 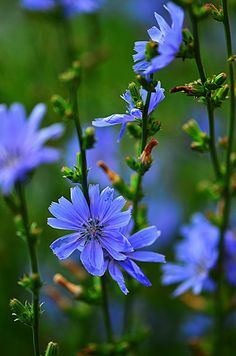 Nutritionally dense and toxic to parasites, chicory is also widely used as a forage supplement for livestock. Though what grows above ground is valuable, the roots of the chicory plant are where its real treasure lies. When roasted and ground, chicory roots have been used for centuries as a nutritional supplement. Chicory contains inulin, a powerful probiotic. Proponents claim that chicory can cure or lessen a variety of ills, including digestive problems, heartburn, arthritis pain, heart disease, anxiety and stress. Some believe it can detoxify the liver and gallbladder, prevent bacterial infections, protect against kidney stones, speed the healing of wounds, aid in weight loss and even cure some types of cancer. It may also be a natural sedative. But if you’re a student of history, those uses for chicory are likely not what you think of when you first hear the word. You know that when times were tough and real coffee was hard to come by, chicory was used by those who craved a hot, tasty brew. Though roasted and ground acorns were sometimes made into “coffee” when the real thing wasn’t available, chicory was by far the substitute of choice. Confederate soldiers drank it. People drank it during the Great Depression. And it’s frequently been served in prison because it’s cheap and easy to come by. Though chicory contains no caffeine, it does have a flavor similar to coffee. Back in the mid-nineteenth century, folks in Louisiana were happy to make that discovery. By 1840, the port of New Orleans had become the second largest importer of coffee (after New York City). When Union naval blockades cut off coffee shipments to New Orleans during the Civil War, coffee aficionados substituted chicory. Even after the war ended and real coffee became available again, the tradition continued. The world-famous Café Du Monde still makes its renowned café au lait with steamed milk and a coffee-chicory blend. I’m game for trying chicory. I don’t know if I’ll be able to find it in local stores. But if I can’t, I’ll order it online. Who knows? My next column just might be written at my kitchen table while I sip some Louisiana brew and enjoy an autumn bouquet that doesn’t include the beautiful blue wildflower with the magical root.